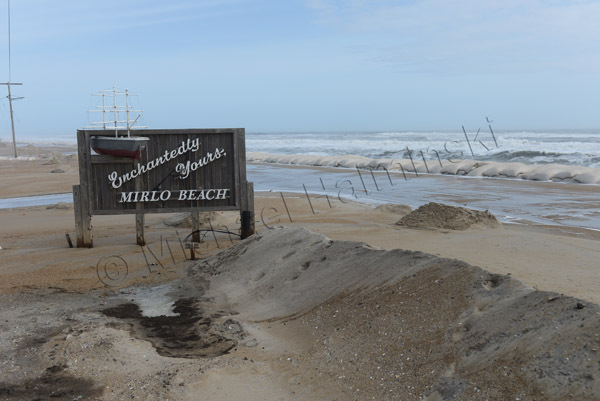 The road conditions at Mirlo Beach continue to plague NCDOT, as well as residents of Hatteras Island. It’s an issue that has been ongoing during the decades that I’ve lived here, and longer. In the past several years the problem has accelerated and occurs more frequently. NCDOT’s reaction has been to perform the same repairs over and over again. 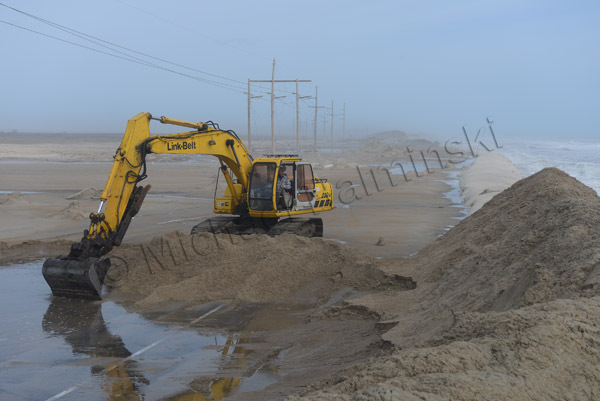 They dig overwashed sand from the road surface, and pile it seaward to build a dune. 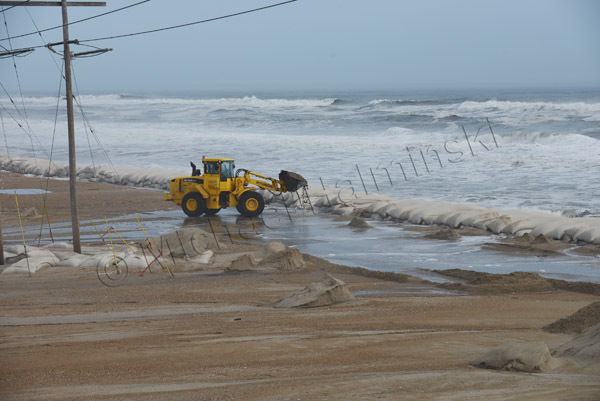 Storms wash over the dune, moving the sand back onto the road. 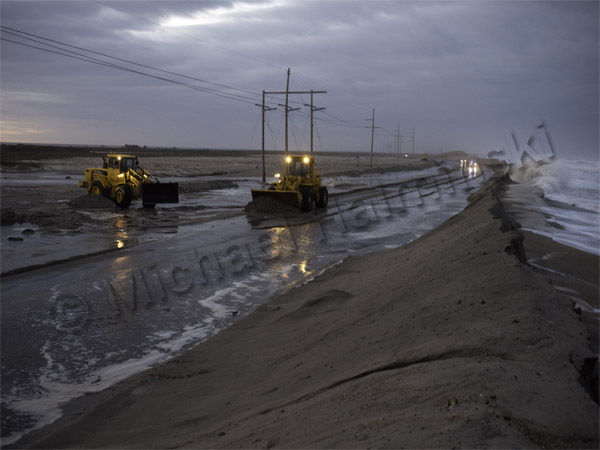 The recent storm that moved off the coast buried the road and left standing water on the surface. I put my boots on and walked there to document the scene in photographs… again. A number of homeowners in the Mirlo Beach subdivision have been trying to repair their condemned rental properties in hopes generating income. 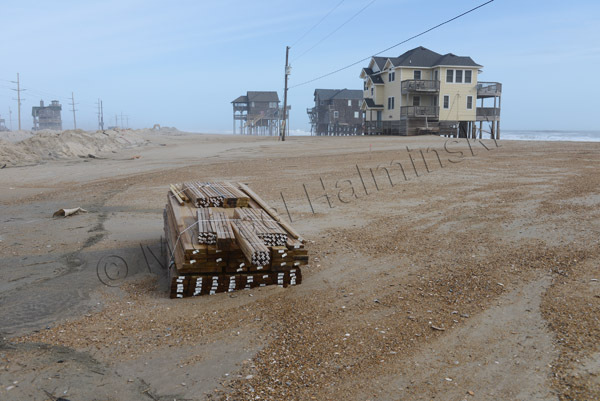 A pile of newly delivered lumber lies washed up in the sand. The approach taken to save Mirlo and highway 12 is not working. The sign at Mirlo has become a contradiction. 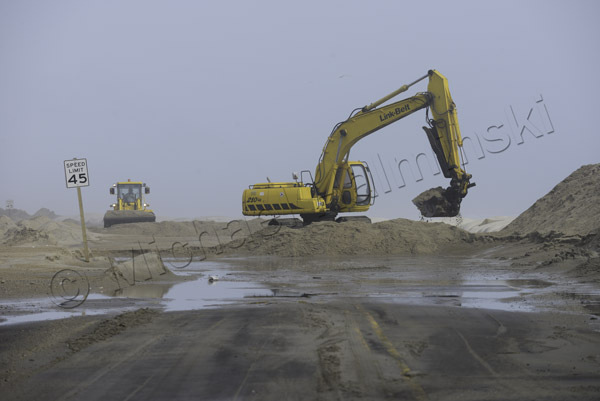 NCDOT’s tools of preference for a fix is heavy equipment, but it’s no match against the power of the sea. A front end loader is dwarfed in the environment. 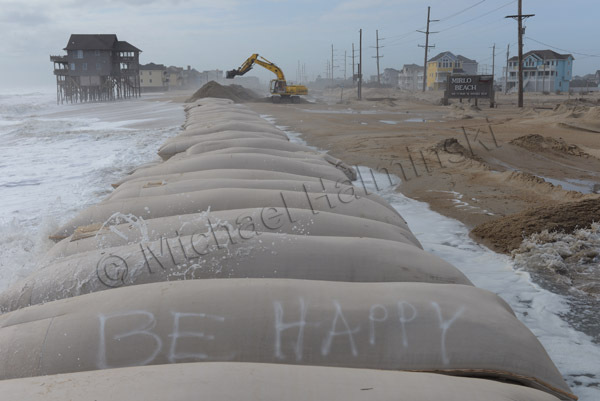 An excavator removes sand from the road surface, and piles it on top of a huge sandbag barrier. A bit of optimism is expressed in adversity. Vehicles endure the salt water to access the island. 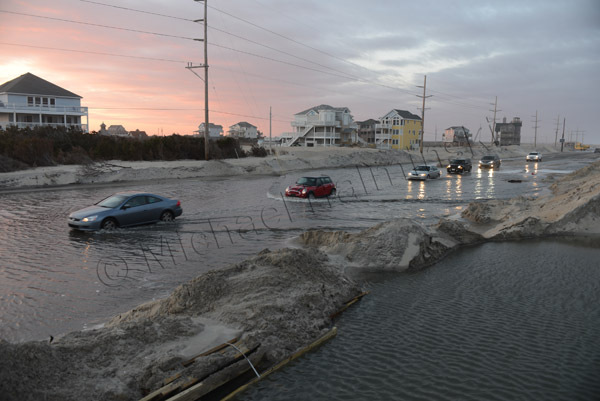 During periods of high storm tides, the road is impassable. A fixer upper stands tall in a setting sun. 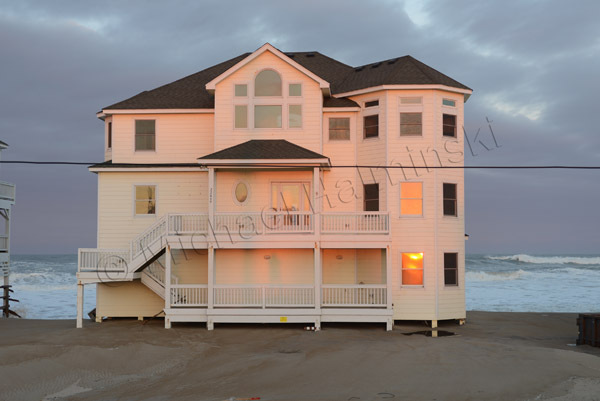 This entry was posted in buildings, Outer Banks, Sea, storms, Weather on March 14, 2013 by j0jgvm89bj. My next door neighbor is responsible for these hideously cruel abductions. Being a commercial fisherman, he sets his traps, baited with lots of fresh fish, on his property, within 80 feet of my house. He says that he’d never kill a cat, yet two weeks ago he admitted to have caught 7 or 8 cats, and releasing them miles away. 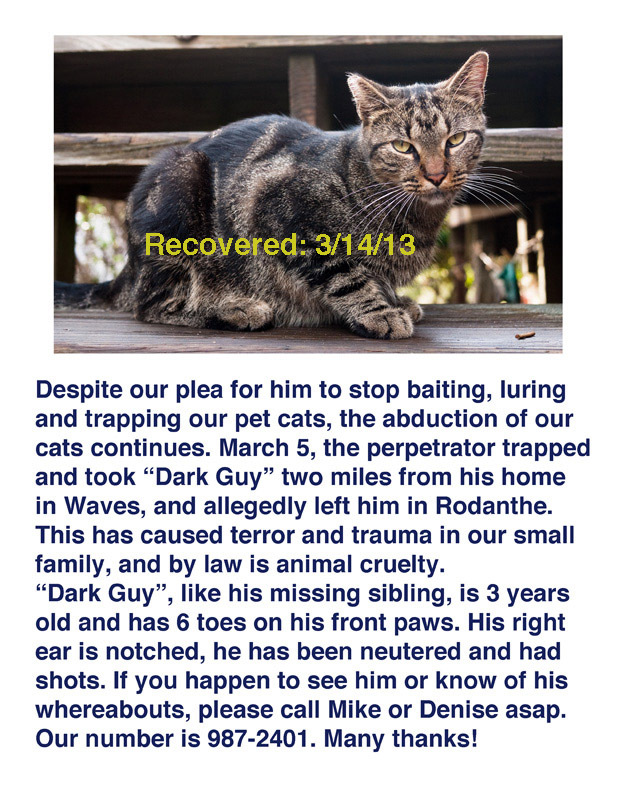 We are still hopeful of recovering our precious felines. I am circulating another poster and have lots of folks in the community on the alert. This entry was posted in Animals, Outer Banks on March 10, 2013 by j0jgvm89bj.